My Travel System.. – it's a mums word.. I thought I’d share my experiences of my travel system so far. And no I don’t mean my fancy new wheels (I wish). Gone are the days when I could drive around in a lovely sports cars with two doors, two seats and a teeny boot. When I say travel system, I am referring to my baby’s travel system. Talking of cars though, I do struggle with my normal size hatchback to fit everything I need for baby, so perhaps I do need some new wheels (hint to the husband). When looking for a car seat, safety and ease were the two factors that were most important to me. Myself and the husband debated on the safety element for some time, and in the end we reached a compromise and went for a car seat that fitted the bill for both (or so we thought). So, we opted for the Maxi Cosi Pebble Plus, which is suitable for age 0-12 months and would slot nicely onto our pushchair frame. The car seat itself was £190, but we were lucky enough to have this gifted to us from my sister. In addition the base is £150. My baby was a tiny baby, weighing 5 pounds 13 oz at birth, and to my surprise, I found carrying him in the car seat a struggle from the start. I have no idea how mothers cope with bigger babies, and I stuggle even more now that he is so much bigger. I guess to combat this, it fits nicely onto the pushchair frame, but in my experience I find it a bit of a faff to get on and off the pushchair frame, and ever since I experimented with this and using the adapters, the isofix base in the car sometimes freezes.. Not quite the ‘ease’ factor I had in mind. To make matters worse, my baby dislikes being sat in the car seat, and will often scream and have a tantrum until I take him out. My visions of popping into my mum’s with a peaceful sleeping baby, undisturbed still in the car seat, has been well and truly shattered. My car seat remains in the car all of the time and I am always scared we will have a tantrum on our hands every time we step foot in the car. So, I no longer need the ease and portability factor and am therefore kicking myself for not listening to the husband and opting for a safer car seat that lasts until the baby is much older. Take this as a lesson and think hard and long before making any purchases. 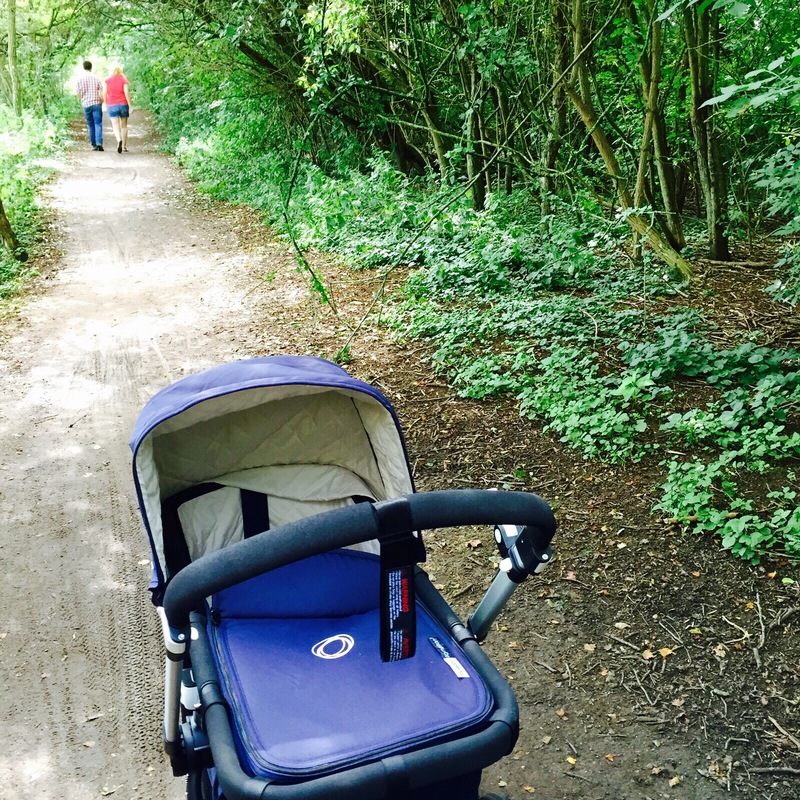 Thank god for the Bugaboo Cameleon 3. We opted for the limited edition navy (suitable for a girl or a boy), setting us back £875. My baby has loved this since the very first time we used it (much to my surprise as we were struggling so much with car seat journeys at the time). I find the frame easy to assemble and dissemble, and the carry case clicks into place easily. I can manoeuvre the pushchair easily and it is very lightweight, perfect for a petite weakling like myself. The best part about it is my munchkin loves it, he much prefers being lay flat and can look around and take in the sights. The only downside, as mentioned previously, is it does take up most of my boot space, and there isn’t much storage for baby bag/shopping. My munchkin is lucky enough to have enjoyed many walks in the park, the countryside, and around my local shopping centre and so far, this has been one of our most successful purchases for Sami. Do you wear him on your hikes as well? Yes, we do. We started only around the block in the first month or so. She’s 14 months now and we’ve snowshoed, hikes up waterfall, and explored the lake shore. One of my favorite things about baby wearing is the amount of things I’m able to get done around the house if Cicilia just doesn’t want to be set down (mostly when she was in the first 6 months). I’m curious which baby carriers are popular in the UK? I have a Tula, Fidella wrap, and ring sling I’ve used the most, the JJ Cole especially when she was in the first 3 months. There are so many out there!